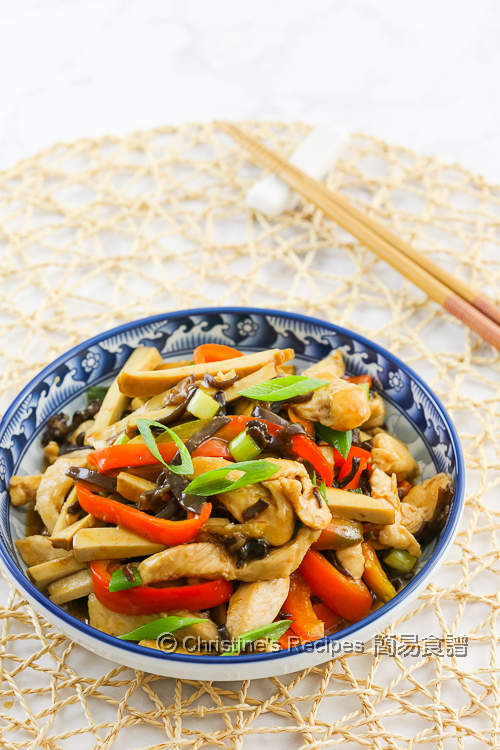 This dish was inspired by the classic Szechuan spicy cooking that always produce an intensive taste. You might’ve heard or tried a classic one, spicy eggplant with minced pork (aka fish fragrant eggplant, literally translated from Chinese, 魚香茄子). To create this new recipe, I tried to hit a lighter note, with less heat. Its tangy and mildly sweet taste, mingled with a slight heat was exactly what I pursue. 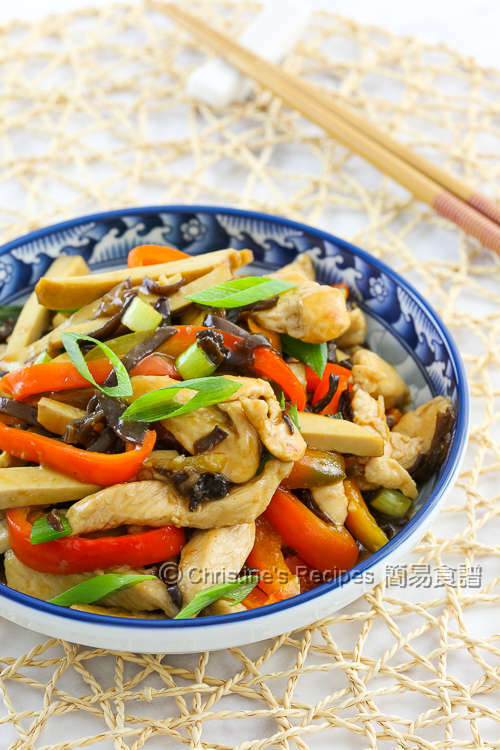 It tastes really good and goes perfectly with steamed rice. If you like more heat, you may add a bird-eye chilli or add more chilli bean sauce then. Soak wood ear until softened. Cook in boiling water for 10 minutes. Drain well. Set aside. Mix all the sauce ingredients well. Heat oil in a fry pan over medium high heat. Cook the chicken until it turns white. Set aside. 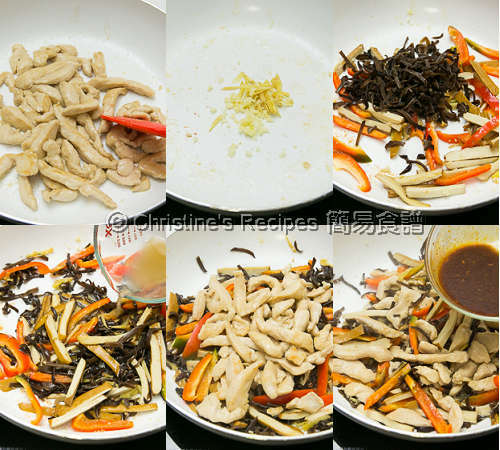 In the same pan, sauté ginger and garlic until aromatic. Add tofu, capsicum and wood ear. Stir fry and heat all the ingredients evenly. Add chicken stock. Bring it to boil. Toss back the chicken. Pour in the sauce. When it boils again, it’s done. Sprinkle spring onion for garnish. Serve hot. 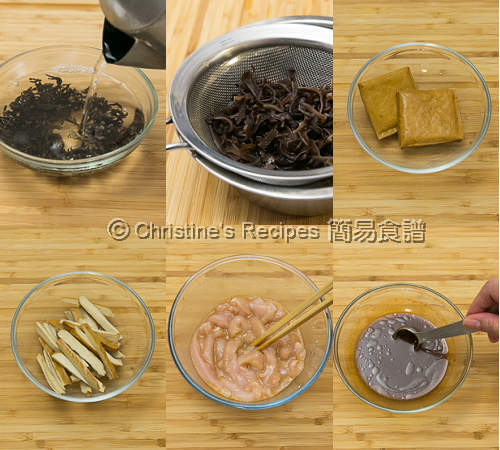 By cooking in boiling water, wood ear will be softened enough and convenient for stir frying with other ingredients. If using large pieces of wood ear, you might cut them into strips after softened. The amount used is the same. Spicy dried tofu is available at Asian grocers, normally chill in fridge. Red capsicum is not hot, yet with a mild sweet taste. Homey and delicious! I love the combo of tofu, chicken and wood ear.